The first fighting broke out in the desert near Brega, a strategic oil town. 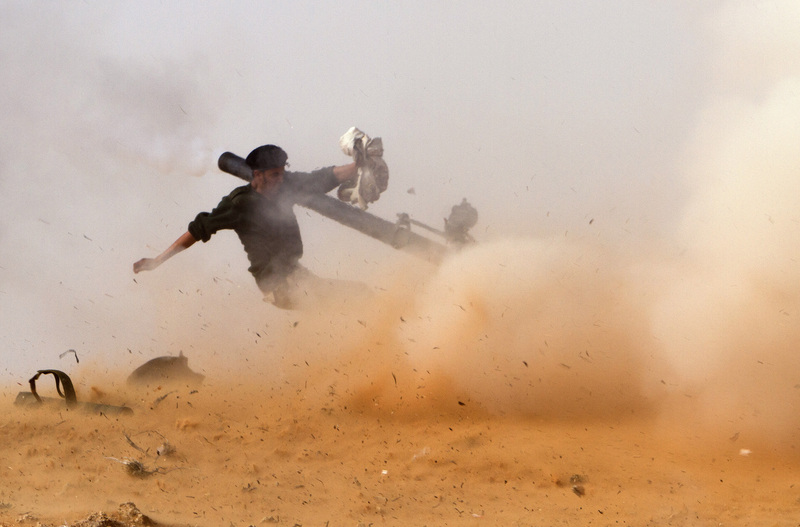 The Qaddafi forces had air power; the rebels and photojournalists lay on the ground with no place to hide, hoping for the best. At one point, certain that we could not survive, I crawled over to a colleague who has been one of my toughest competitors for many years, kissed him on the forehead and said, “You know I love you.” I think if I have it in me to kiss someone under such a situation, I am still what I want to be: woman and human. The rebels gave us full access until it became obvious they were losing. Then they tried to prevent us from going to the front, but we would wrap our heads in scarves like them, jump on the back of pickup trucks and let the scarves’ pom-poms fly in the wind. Wherever we went, it was clear how unprepared the rebels were: Many said they’d never picked up a weapon before in their lives. Some came wearing sandals, and a couple even arrived with their bed sheets wrapped around them like cloaks. Wherever we went, they offered to share plastic bags of sugary fruit juice, a few dates, a chocolate bar, or some forsaken take on American Twinkies. Fresh bread was always around, somehow. Everywhere we tried to settle for a night or two, we found ourselves fleeing. One minute I was hanging my hand-washed laundry, and the next, it was left behind as we escaped. 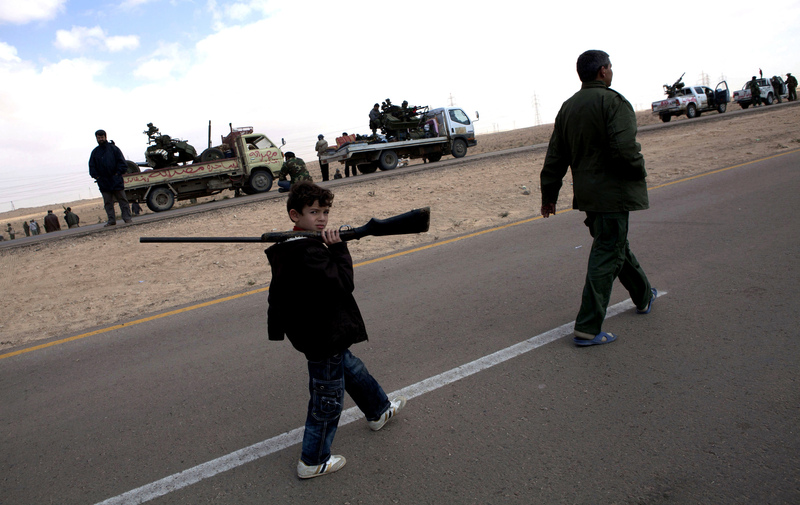 We feared the Qaddafi forces would cut us off, or that we would be captured by them. The rebels were never ashamed to run away. We were in Benghazi as Qaddafi forces were advancing and you could hear the wind of the bullets. The scene was a mixture of dread and exhilaration: The rebels had captured a few loyalist tanks and were driving them around town in a celebratory manner in the midst of an attack. I was with rebels when a shell slammed into a cement building just meters away, creating massive panic, and a fleeing jeep drove into me at full force. My lens snapped in two; my leg, though deeply bruised, was not broken. Two rebels carried me into a car and wanted to drive me to a hospital, but I refused because I feared the hospital would be overrun and I would be captured. Besides, I still wanted to work. When I returned to Libya in August, Ramadan had just finished and the rebels’ successful, speedy advance on Tripoli took everyone by surprise, especially since they were met with very little resistance. On that trip, we encountered horrific scenes. In a Qaddafi field hospital at the side of the road, we found more than 50 executed patients, some still attached to IV drips with their hands bound by the green flag of the Qaddafi forces. At another hospital in Tripoli’s Abu Salim neighborhood, the victims seemed as if from another world, sprinkled with a coating of lime powder to neutralize the foul smell of the dozens of decaying bodies. The powder preserved and outlined facial expressions and the terror apparent on the faces seemed frozen, caught in time. Perhaps they ran out of the lime because in the basement there was no white powder; victims were soaking in blood and it was difficult to keep my footing and not slide in the puddles. If there could be an image of Hell, their expression on their face captured it. As we drove, we would see tents mysteriously going up in smoke, burning the evidence of what was inside. We met a man on the road who had photographs of people he told us had been killed in a massacre. Pointing, he told us where to go. We found at least 50 burnt bodies in a construction site nearby the Khamis Brigade Compound in Tripoli. I never truly understood how opposite black and white were until we walked into a shed to find the victims burned down to their skeletons. I kept asking others with me who had covered war and witnessed horrific scenes throughout the years if they had ever seen anything like this. They—we—all answered no. Those days have filled my head with ghosts.